Interface has now completed its tenth year publishing research and theory “for and about social movements”, by activists, academics and independent scholars. As always, it is entirely free and available to download either as the full issue or as individual articles. The Interface editorial spokescouncil expresses its solidarity with the tens of thousands of currently striking academic staff at 61 universities across the United Kingdom. Some of our authors, reviewers, editors and other collaborators and friends of Interface are also involved in this action. The academics’ trade union, UCU (University and College Union), had overwhelmingly voted in favour of strike action (86% of the 64 universities balloted), thus beating the draconian anti-union legislation implemented since last year and designed to impede a positive vote for industrial action. The 14-day long strike, which began on 22 February, is segmented into expanding blocks over the course of four weeks. University workers, with much support from students, are fighting in defence of their pension scheme, as the Universities UK’s (UUK, the committee of British universities’ vice chancellors) refusal to negotiate this decision would see huge cuts in pensions and make them susceptible to market speculation. This is yet another attack on pension rights and what is left of the public university. Vice Chancellors have benefitted from absurd wage increases, leading aristocratic life styles at the expense of university workers, academic and support staff, and increasingly indebted and impoverished students paying high fees, but with fewer and fewer employment prospects after graduation. This is the consequence and culmination of the neoliberal agenda, marketization and backdoor privatisation that has been pursued by both the previous Conservative and New Labour governments for over two decades. But university workers have said enough!, and are turning out in numbers on the picket lines braving the freezing temperatures and snow coming from a Siberian weather front, with teach-outs and many other mobilisations that inspire both students and university workers to re-learn the tools of collective resistance and explore the potential of education that re-connects the theory to practice, and practice to ideas where alternative futures are born. Our solidarity and support to the striking workers and students in the UK! We’ve (finally) done up a flyer for Interface. If you’d like to help us out, please download it (755k), print off a few and leave them around somewhere that interested people might see them (or stick one up on a noticeboard, or…) The flyer has great artwork by Rydell and isn’t looking for money or members. You can download it here. Thanks! Marianne Maeckelbergh’s article “Horizontal democracy now: from alterglobalization to occupation“, published in Interface 4(1), was included in the 2013 Athens Biennale’s AGORA exhibition in a project by Eva Fotiadi and Nikos Doulos. Entitled “Event as process: cities in an ongoing state of emergency and the artists’ stance“, the project is an online engagement with “the city as a mediated portrait, artists’ responses, and the pursuit of spatial justice”. Congratulations to Peter Ullrich and Gina Wollinger, who won a German Surveillance Studies Network prize for their article in Interface 3/1, “A surveillance studies perspective on protest policing: the case of video surveillance of demonstrations in Germany“. More details here (in English) and here (auf deutsch). 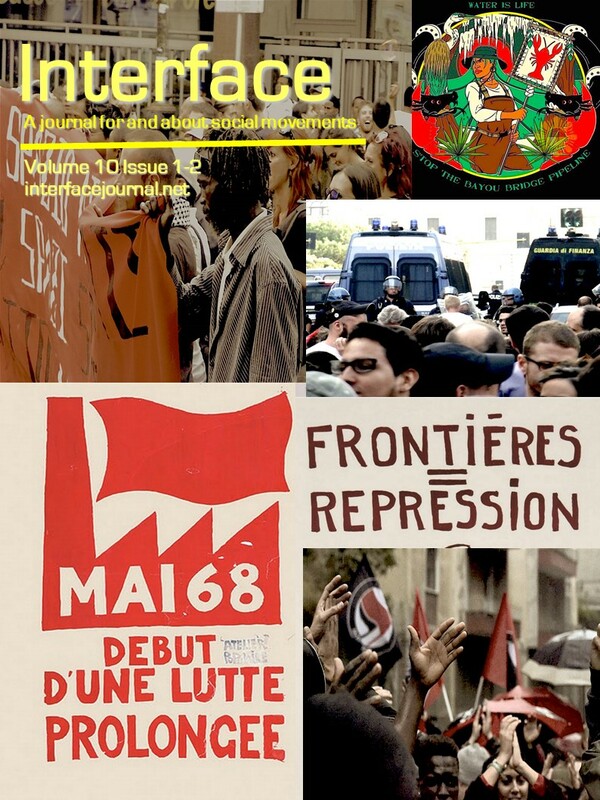 Interface: a journal for and about social movements is now into its sixth year and working on its eleventh issue (with two more years of discussion and planning before that!) Over this time we’ve brought together people researching and theorising movements to contribute to the production of knowledge that can help us learn from each other’s struggles: across languages, continents and cultures, across movements and issues, across the academic / activist divide, and across political and intellectual traditions. We’ve brought out issues on movement knowledge, on the relationship between civil society and social movements, on crisis and revolutionary transformations, on movements and alternative media, on repression, on feminism and women’s movements, on the Arab Spring, on new struggles around work and on anticolonial and postcolonial movements. 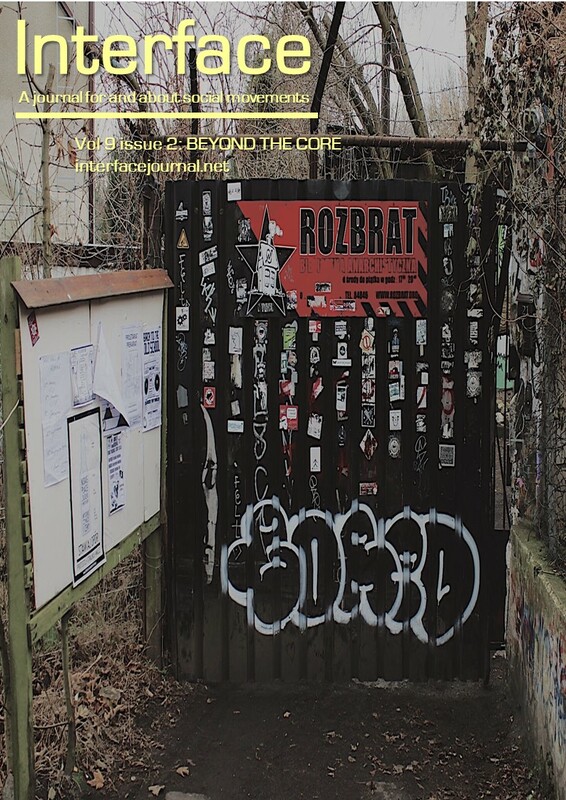 Alongside these themes, special sections have focussed on debating David Harvey, on international labour communication and on feminist strategies for change, with a forthcoming special section on the new European mobilizations. Each issue also includes many items on topics beyond these special themes. In all our first ten issues run to 4,041 pages and 238 pieces! So far, we’ve published activist interviews, testimonies, editorials, articles, action notes, research notes, event analyses, key documents, debates, bibliographies, round tables, special contributions, book reviews and review essays by authors located in Angola, Argentina, Australia, Austria, Brazil, Britain, Canada, Dubai, Ecuador, Egypt, Germany, Greece, Hungary, India, Ireland, Italy, Latvia, Mexico, the Netherlands, New Zealand, Nigeria, Norway, Palestine, Poland, Portugal, Russia, Senegal, South Africa, South Korea, Spain, Swaziland, Sweden, Switzerland, Thailand, Tunisia, Turkey, the UAE, the USA and Venezuela. We have already published in Catalan, English, German, Italian, Portuguese, Spanish and Russian. Beyond these we can accept material in Afrikaans, Arabic, Catalan, Czech, Danish, English, French, German, Hebrew, Italian, Maltese, Norwegian, Polish, Portuguese, Russian, Slovak, Spanish, Swedish and Zulu. We hope to expand to include more world languages in future. In the meantime, you can see where people are reading us from here. Interface is indexed by the Directory of Open Access Journals, WorldCat and EBSCOhost. We are still working on many fronts – developing the project in different regions of the world, expanding the range of languages used, extending the collective production of the journal, finding appropriate ways of linking the journal to movement needs and processes, ensuring the quality of what we publish and securing intellectual and academic recognition. We have done a lot in the past seven years, but there is a lot to do. This new website is designed to be part of this process, keeping our orientation as an open-access (free) space for dialogue and involving a wider community of movement practitioners and activist scholars as authors, referees for articles, book reviewers, issue editors, translators, website editors, and other supporters. Participants with particular skills / interests are always welcome! We hope you enjoy the journal, and that the material here is helpful to you in reflection on your own struggles, developing your activist practice, researching social movements constructively, debate within organisations and dialogue between movements. There is a world still to win.